How to justify a machinery storage facility on your farming operation? Often there is not an easy answer, the following ideas may help you decide what the benefits of farm machinery storage are. Less deterioration of your equipment due to weather or better resale values may be deciding factors in putting up such a large building. Will your savings be sufficient to recover the high initial building investment? The answers to these questions often are not clear-cut. More reliable equipment performance, because loss of time due to equipment failure during the farming season is expensive. Keeping your equipment in good shape during the off-season with a proper machinery storage building may save you precious time and money in the long run. Deterioration of machinery parts due to weather can be reduced with a building housing the equipment. Easy access to your equipment can be achieved with the proper door placement of a large hydraulic or bifold door. There are a few reasons why more and more farmers are deciding to house their farm equipment in machine sheds. Farmers are able to get more money for their used farm equipment when they decide to sell. 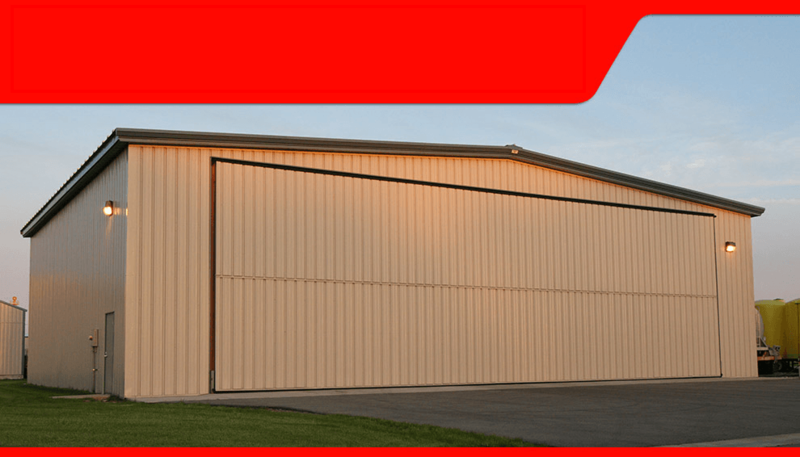 With all the farm equipment under the same roof, they have easy access especially with large doors that can act as walls and openings at the same time. Farmers can worry less about their equipment being vandalized or stolen when in a	building. Also, a building is much easier on the eye to someone driving by then a pile of machinery out in the open. Putting up a new building to accommodate todays larger machinery may be more cost effective than remodeling an existing structure. With newly developed large size doors putting a new building together that allows easy access to farm equipment is much simpler than it was twenty years ago. Large hydraulic or bifold doors can incorporate smaller man doors into them if you wanted to use your building to house other farm related supplies that a large size door wouldn't need to be opened for. The following ideas will help you in the overall placement of your building, building doors, size of building, and creating a machinery storage building that works for you. 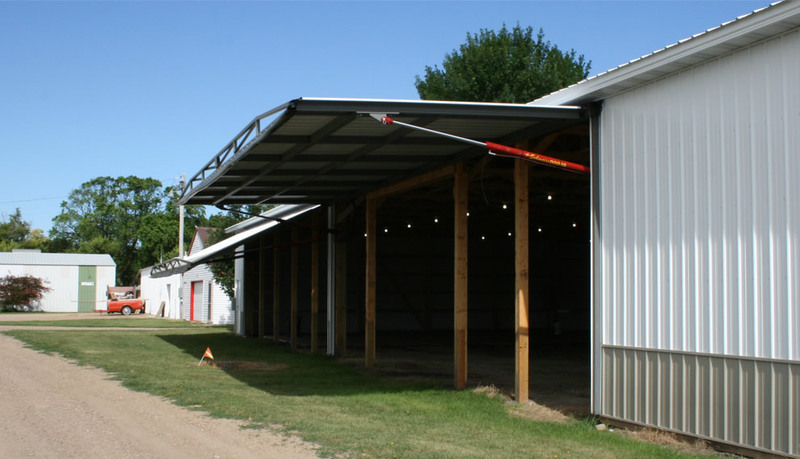 When deciding where to put your machinery storage building there are a few things to keep in mind. Put your machine shed in a convenient location, located near the farm shop, if you have one, and close to the house but not so close that the sounds from the machinery may bother someone inside. You want to have a clear view of the machinery shed from the house so you can help keep it secure and look over it. So that you can keep large hydraulic or bifold doors open during the farming season you should consider placing them on a side of the building that is out of the wind to prevent damage to your machinery. You should also place them out of the eye of passer-by's so you can keep your machinery safe. You should locate the machinery storage building near the farm shop so you can easily work on your equipment when needed. Your machine shed should be so large that you do not have to move things around when loading and unloading machinery. 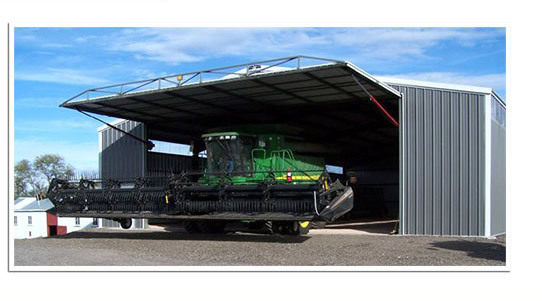 This can be most easily achieved with incorporating an oversized hydraulic or bifold door that can act as one wall of the building when closed and when opened get you easy access to any equipment in any location in your machine shed. When laying out your machinery storage building, you have to think through a number of things. You should know what equipment you have decided to house in your building. You want to know the kind of building that will work best for you. You need to know how much space is needed for the equipment you are deciding to house. Determine where you should locate your large machinery doors and personnel doors so you can map entering and exiting patterns. You should do all these steps more than once so that you can find the perfect layout for you. When deciding what you want to put into your storage facility you need to keep in mind everything equipment related from what you did a few years ago, to what you are doing now, and to where you think your farm needs will be heading a few years into the future. Thinking this through well will help you determine the best size building and the most effective building for your personal use. Because long buildings with a short width and shorter buildings with a long width can have the same square-foot areas, you have to determine what is most appealing to you. Even if the area on the site is not a factor, you should keep in mind that there are standard post/beam spacings for buildings and that your overall building length and width should be a multiple of these spacings. These spacings are also important when determining your door sizes, so you can get the maximum door size for the determined post/beam spacings. A long machine shed with a narrow width typically tends to work better with smaller farming operations. You have to keep in mind with this type of building that you typically need to put your machinery straight in and take it straight out. It is better for smaller farming operations because smaller post spacings can still house smaller harvesting machinery. You may have to stack in smaller equipment making it harder to get tools in and out with ease. You should maximize your post spacings and door sizes to get the right size bays for your farm equipment. 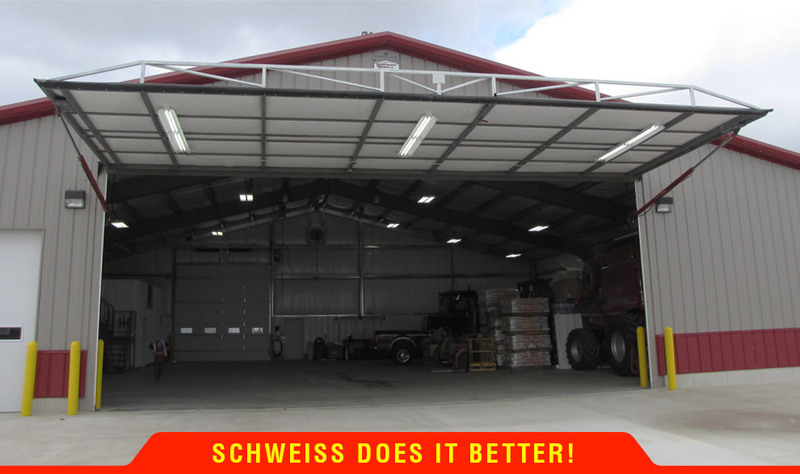 Schweiss recommends a shorter machinery shed with a large width because they tend to work better for the larger farming operations. These buildings allow easier maneuvering of farm equipment inside the building, allowing the building to be completely enclosed. With a large hydraulic or bifold door at each end of the building, machinery can be either housed or driven straight through the building. The path through the center of the building can be left open or used to house more frequently used equipment. Storage of machinery for extended periods of time is best suited for the spaces on each side of the path running through the center of the building. If you have a long storage facility with a large width you will want to also put doors on the sidewalls of the building. Because hydraulic and bifold doors can be made to any size, they are the best option for these sidewall doors. These sidewall doors allow you to put machinery clear across to the other side of the building. Personnel doors can be put into these large hydraulic and large bifolds for easy access of a man or woman to any part of the building. Always with steel constructed clear-span buildings, keep in mind the post spacing and posts needed for door headers when laying out your building. When determining the floor space needed for your machinery storage facility you should keep in mind what equipment you have used in the past, your present equipment, and any equipment you may use in the future. The best way to determine your total floor space is to make a list of each piece of equipment to be stored. On this list you should multiply the width and length of the each piece of machinery to get the area of each one. You need to keep in mind that you will need space in between your machines and that each machine might have a number of different possible layouts. For example, if you have a piece of machinery that folds up or another with a detachable piece of equipment. Add the square footages together on this list remembering to add the square footage of the spacing between the machinery and then you can determine your overall building size. Because machinery size is the determining factor in the size of doors you need, you should measure each piece of machinery and where the machine will be stored in the building. Twelve-row combines need a door width of 40 feet and door height of 16 to 18 feet. This door size is easily achieved with a hydraulic or bifold door, which can be made to any size without losing headroom. Large fold-up machinery will require the most headroom which can be high as 21 feet. When planning on headroom do not forget about the lighting or heating tubes or overhead cranes in the building that will take up extra headroom. Allow a tall enough building to handle the extras you may add to the inside of your building at a later date. Customers frequently ask Schweiss, "What size door do you recommend for my building?" We suggest if your building is going to be 50 feet wide stay back 4 feet on each side and that will allow you to have a 42 foot wide door opening. They comment and say I only need a 32 foot door, we'll recommend going with a wider door because it allows you to park four vehicles side-by-side without having to move one to get the other vehicle out. This is a real advantage of a wider door, when you're farming and storing equipment your door width is never large enough. The size of the building we are talking about is just an example, it may be 60', 70' or even 80' wide, make the door large enough right away and build for the future. Doors located in endwalls are determined with a number of factors. There used to be a time when you put a door in an endwall you did not want to exceed half the building width so you could keep long-term storage to the sides of the building. That's not the way customers are doing it today. Thanks to hydraulic and bifold doors it is common to open the entire endwall of your building up by installing a large door. Most of the time when you put a door in an endwall you may want to stay back four feet from each sidewall of the building, this gives you a very large door opening. Hydraulic and Bifold doors can be installed when you need larger width openings without losing headroom or long-term machine storage to the sides. 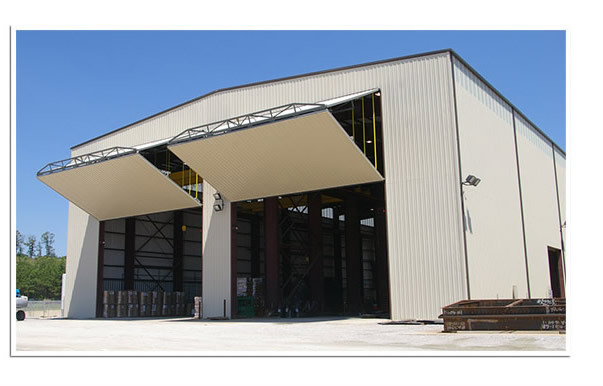 Hydraulic and Bifold doors fold up to the outside of the building and can be extended to the roof so that the door fully open will reach the bottom chord of the roof truss in all types of construction. Because sliding door tracks extend beyond the building width when the door opening is more than half the building width, Hydraulic or bifold doors are the best option. Doors in endwalls in larger width machinery sheds should be centered on that endwall otherwise you may lose easy accessibility to storage to the opposite sidewall of the building. 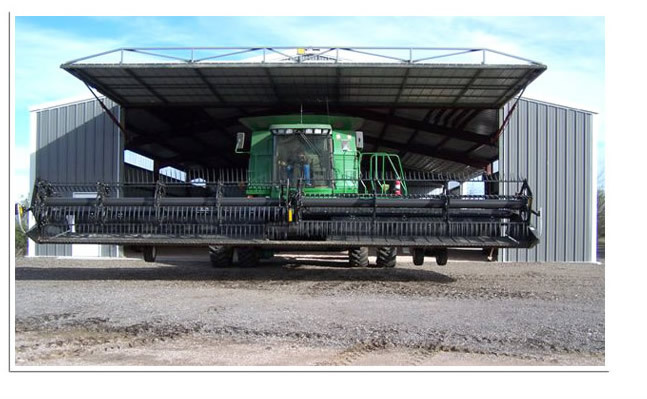 Sidewall doors can be built to any size depending on the post spacing and may need to be as wide as 32 feet or larger for equipment like 12-row combines. You should keep in mind that the larger width openings need larger building headers so keeping the door only as big as it needs to be is important when you are planning a sidewall door into your building. Check your building accessibility with a scaled drawing of your building and scaled models of your machinery. By doing this you can check out the most efficient size and type of building for you. You can check out different building shapes and check out the most efficient placement of doors as well. Grid paper works best for this. You can represent each square in the grid as a multiple of number of feet. If your building does not fit on one sheet of grid paper feel free to tape more sheets together. Remember to make cut outs of equipment for the past, present, and future. Remember how each piece of machinery can be moved, and if there are major space flaws look at increasing your hydraulic or bifold door sizes. Remember to keep the floor of your machine facility above grade to allow proper drainage and so your building will not become flooded. A thick layer of crushed stone or gravel is the best and most cost effective floor for your machine shed. Other types of flooring may get too expensive and will not be justified for a building just to house machinery. A concrete apron in front of the large machinery doors is a good idea to keep the level of the ground even, provide much needed support for larger doors, and keep the doors in excellent condition. When posts are eliminated in post-frame construction for door openings, it is recommended that you double the posts up on each side of the door opening. This support may also be needed for larger size hydraulic / bifold doors. Lights will not be needed frequently in a machinery shed so getting by with the bare minimum is recommended. Most of the time the storage shed will not be used after the sun goes down. Exterior lighting is a good security precaution to keep vandals from damaging your equipment at night. Vent your machinery shed adequately to avoid condensation buildup on your tools. By following all of these steps you can create the best possible machinery shed for your dollar and the most practical one for your equipment needs.